VSAFF is proud to be a Community Partner for the Jan. 30 screening of Shepherds and Butchers at the Vancity Theatre (6:30 p.m., 1181 Seymour St.), a co-presentation of the Vancouver Foreign Film Society and VIFF Vancity. This is the first commercial screening of this fabulous film since VIFF. Inspired by true events, Shepherds and Butchers is a story that puts the death penalty on trial. In 1987, 164 people, most of them black, were legally put to death in South Africa. 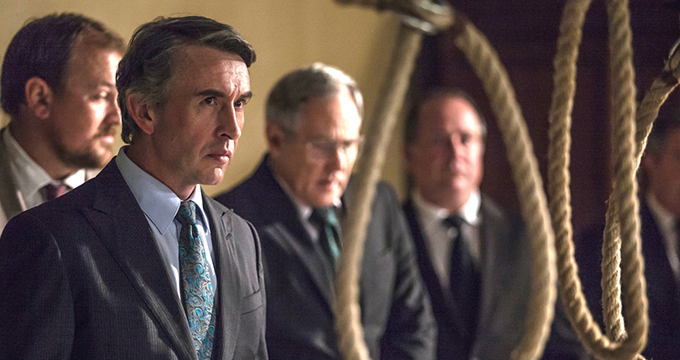 Oliver Schmitz (director of the groundbreaking anti-apartheid film Mapantsula, VIFF ’89) brings us a tense courtroom drama, set in ’87, which stars Steve Coogan as a crusading lawyer whose anti-capital punishment position leads him to take on a seemingly impossible case. Nineteen-year-old former prison guard Leon Labuschagne (Garion Dowds in a star-making performance) is accused of shooting down seven black men on a highway one night. He admits he committed the awful crime; it’s just that he has no memory of the incident and is at a loss to come up with a motive. Enter British defense lawyer John Weber (Coogan) and prosecutor Kathleen Marais (a terrific Andrea Riseborough); she sees an open-and-shut case while he argues for extenuating circumstances.